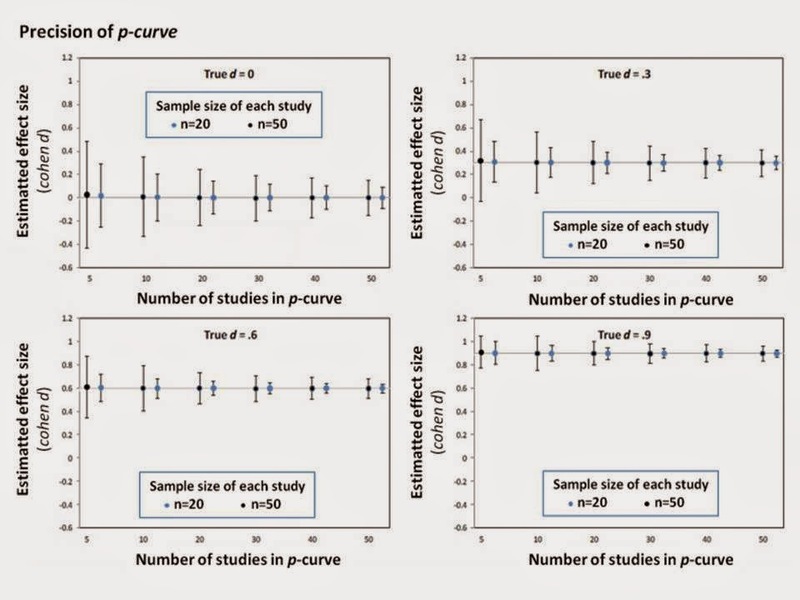 The All Results Journals: P-curve: A Way of Fighting Publication Bias? P-curve: A Way of Fighting Publication Bias? I think we all agree that scientific journals usually do not publish results unless they are statistically significant. That is enough important to consider publication bias in order to estimate the true magnitude of a particular effect. A variety of techniques have been developed for this goal. Some authors review publication bias correction tools that assume selective reporting based on p-values (probability of obtaining a test statistic at least as extreme as the one that was actually observed, assuming that the null hypothesis is true). Usually scientists publish significant effects (p<0.05) and spurn (on file-drawer) the rest. A new paper has been recently published based on a p-curve where the authors suppose that if the true effect of something is X, and you do a bunch of studies, then statistical chance means that you'll get a range of results arrayed along a curve and centering on X. According to the published study, when a studied effect is nonexistent, the p-curve is uniform, by definition. Moreover, for any given sample size, the bigger the effect, the more right-skewed the expected p-curve becomes. They say p-curve is more precise when it is based on studies with more observations and when it is based on more studies. Less obvious, perhaps, is that larger true effects also lead to more precision. This occurs because the p-curve’s expected shape becomes very right-skewed very fast as effect size increases, reducing the variance in skew of the observed p-curves. The skewness of p-curve and the statistical power of a test are very closely related. Both are a function only of the effect size and sample size. The p-curves have a known shape so just looking at the small section of it allows you to estimate the size of the full curve. And this in turn allows you to estimate the true effect size just as if you had read all the studies, not just the ones that were published. Although, to date, no technique exists that can eliminate this bias, we must point out that they have shown that the distribution of significant p-values can be analyzed to eliminate the impact of selective reporting of studies on size estimation.